Irish Salts are world renowned for their high mineral content, low sodium, and powerful taste! To create our Irish Kiln Dried Sea Salt we dry naturally mineral dense Irish Sea Salt in a ceramic kiln - the result is a delicious quick dissolving salt that enhances anything it touches! Our Irish Sea Salt comes from Port Oriel only metres from the sea shore in the picturesque village of Clogherhead seven miles east of Drogheda, County Louth, Ireland. KILN DRIED MINERAL SALT - This natural Irish mineral sea salt is dried in a ceramic kiln, creating a powerful but smooth salt that enhances whatever it seasons. 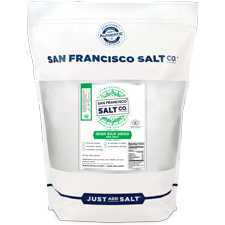 LESS SODIUM, MORE MINERALS - Irish Kiln Dried Sea Salt is world renowned for being rich in minerals and low in sodium, with a powerful taste that allows chefs to use less salt to get the same full flavor. AN ESSENTIAL INGREDIENT FOR PROFESSIONAL & HOME CHEFS ALIKE - Irish Kiln Dried Sea Salt enhances the natural flavor of any food it touches. 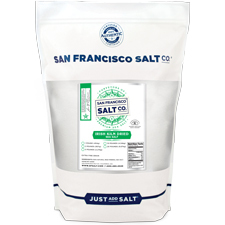 Use this salt on Meats, Veggies, Pastas, Eggs, baked goods, or anywhere you use salt! DESCRIPTION - Kiln Dried Irish Sea Salt. GRAIN SIZE - Fine Grain (preferred choice for sprinkling on food/cooking). 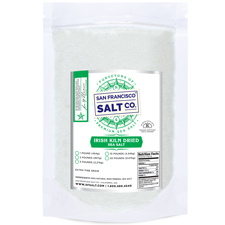 PROPERTIES - Our Irish Kiln Dried Sea Salt is Kosher Certified, Non-GMO, and does not contain any MSG, Soy, Gluten, Dairy, or anti-caking agents. We package in our U.S.A., SQF Quality code compliant facility. INGREDIENTS - Irish Sea Salt.